Mr. Greenberg started the company over 40 years ago. He served as the Chairman of the Board of Greenberg Gibbons since the company’s inception until October, 2010, and has developed nearly 8,000,000 square feet of retail space including the development of Hunt Valley Towne Centre, Annapolis Towne Centre at Parole, and Village at Waugh Chapel, among other projects. 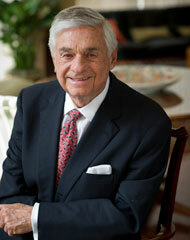 Throughout his long career in real estate, Mr. Greenberg has served on several nonprofit boards including the Real Estate Board of Greater Baltimore, the Baltimore Venture Capital Fund, and St. John’s College in Annapolis, MD, and has served as the president of several nonprofit institutions such as Comprehensive Housing for the Aged, Inc. and the Dumbarton Improvement Association. He is a member of the International Council of Shopping Centers. In addition to founding Greenberg Gibbons, Mr. Greenberg was also a co-founder of Sentinel Title Company. Greenberg Gibbons has established itself as a leader in retail and mixed-use development in the mid-Atlantic states. Their creative, energetic and highly professional development team consistently produces vibrant, innovative projects that contribute to the financial success of their retail clients and serve the needs and desires of local consumers.